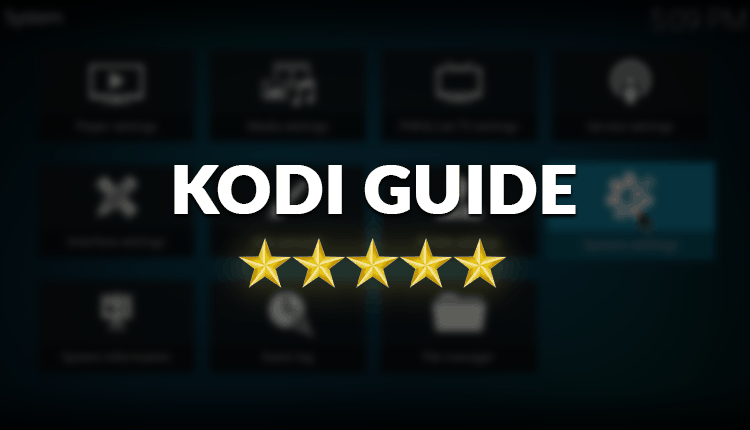 For those new to Kodi, a introduction is required On this Most Complete Kodi Setup Guide. Kodi is a free and open source media player that has been created specifically for home entertainment. It has been available since 2002, and since then it has left an impression on everyone who streams and shares content at home. On its launch, it was known as the Xbox Media Player. In 2003, it became the Xbox Media Center, which remained until 2014 when it was renamed to Kodi. Kodi is the work of the XBMC Foundation which works behind the scenes to deliver the service. Kodi is simply the most powerful software you should have if you’re a big fan of streaming movies, sports and TV shows. It is available for installation on different operating systems and hardware platform that are available in the market. What is Kodi used for? Again for the newbies, let’s talk about the utility of Kodi, on this Most Complete Kodi Setup Guide. Kodi has a variety of uses. In all of them, it makes accessing music, movies and TV shows much easier because of its super friendly user interface. With Kodi, you can stream local content from your laptop, hard disk or smartphone to your big screen. Once you import the films, Kodi can add posters, fan art, trailers, video extras, and more to each item. You can also use Kodi to watch Live TV. Various add-ons let you stream Live TV on your device, and so you can easily catch up with your favorite programs from various channels on Live TV. Kodi Live TV streaming is especially useful for sports enthusiasts, and it allows them not to miss any second of their favorite sports action. Kodi is also useful for watching content on demand. There are hundreds of Kodi add-ons that allow you to watch your favorite TV shows, movies, and other videos whenever you need them. In its simplest form, Kodi is completely legal. Actually, Kodi was acquired in part by Microsoft. It is a general use product just like a web browser. However, how you use Kodi is what brings in the factor of it being illegal. Being a very powerful streaming software, Kodi accommodates a wide range of add-ons. Some of these add-ons allow streaming of pirated content, which is unlawful. The use of such add-ons on Kodi is therefore considered illegal in many countries. For instance, in the UK, there has been a major crackdown on the sale of fully loaded Kodi boxes, with perpetrators even facing legal charges. Some illegal add-ons have also been blocked, especially in a bid to fight unlawful streaming of Premier League action. You can get a legal Android TV Box and then install whatever you want – here are the best legal Android TV Boxes that you can buy. Simply put, Kodi is just the same as how you can use your browser to access pirated content, only that Kodi is more organized and dedicated to streaming. Now, on this Most Complete Kodi Setup Guide, let’s talk about privacy and security, in order you to not getting in the wrong side of the law. Since various add-ons can easily land you in trouble, it is important to take the necessary security measures before you start to use Kodi. No one should be able to identify you on the internet or even trace your activities. ISPs and governments can get the identity and activities of every internet user who does not anonymize themselves. You may then get a copyright infringement notice from your ISP, or even face a legal charge. The best way to stay safe while using Kodi is to use a VPN. We shall see more about VPNs and how to install one later in this Most Complete Kodi Setup Guide. Kodi is compatible with a huge number of platforms. Other compatible devices include the Amazon FireTV ,Nvidia SHIELD Android TV, Android TV Set-top boxes, etc. Being the most popular OS lets begin to talk about Windows, on this Most Complete Kodi Setup Guide. In both, you first need to navigate to the official Kodi.tv download site. In the list of compatible platforms, select Windows. 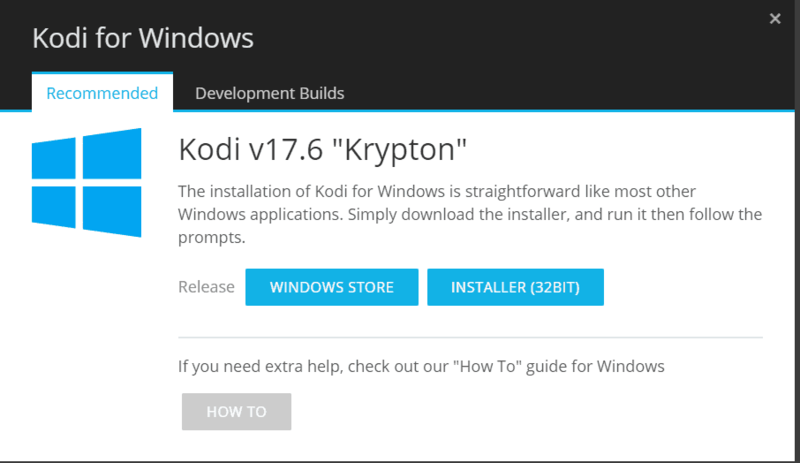 You will now have two options to install Kodi on your Windows PC. If you choose ‘Windows Store,’ you will need to sign in with your Microsoft account in case you already haven’t. You can then click ‘Get the App’, and Kodi will install. If you decide to get the executable file, just click “Installer.” It will automatically download. You can then run the installer. After Kodi has finished installing, you can now launch and use it. 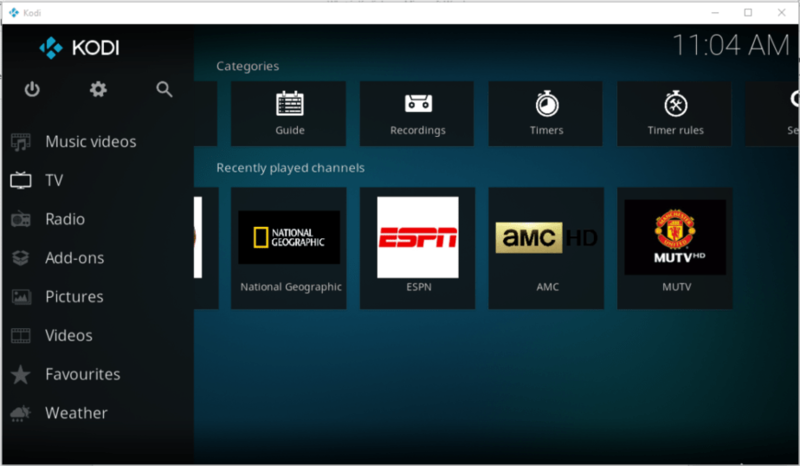 Navigate to the official Kodi.tv download site. 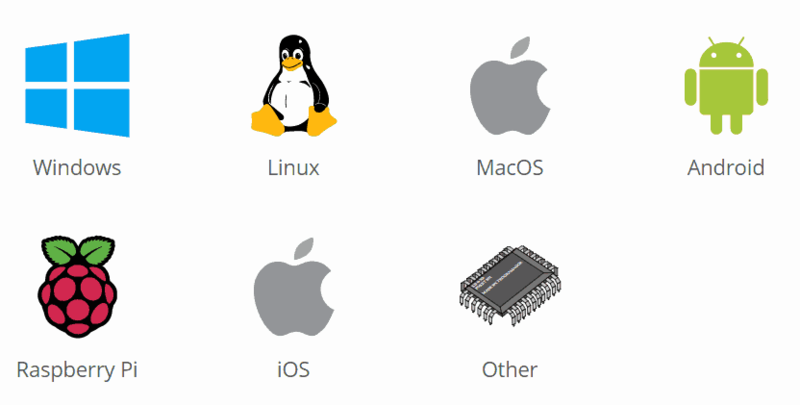 In the list of compatible platforms, select Mac OS. Note: Your Mac might give you a notification that it does not allow you to launch app from unknown developers. If that happens, follow the following steps to disable it. Here we are going to talk about two methods of installing Kodi on Android devices, on this Most Complete Kodi Setup Guide. The first one is by using the Google Play Store, and the other one is by downloading the apk and running it manually. Click on to the first result which will be the Official Kodi app. Go to the official Kodi.tv download site and select Kodi for Android. The app will download. Android TV Boxes are a great hardware where you can install the Android OS. Here on this Most Complete Kodi Setup Guide we’ll make an approach to two methods of installing Kodi on Android TV just like in Android smartphones. Firestick and Fire TV are great ways to have your Kodi on place. There are various methods of installing Kodi on Fire TV and stick. Here on this Most Complete Kodi Setup Guide, let’s talk about the simplest of them is by using the Downloader. You need to have a downloader on your Amazon Fire TV that will enable you to download the Kodi application. It is absolutely free so no need to worry. The downloader that we have installed from the first step should be used now at this point. Boot it up it, and a pop up will appear in the application feeds. The pop up may not appear at times, and if this is the case, go to ‘installed apps,’ and you will see the downloader there. Kodi should now appear on recent files. You can then launch the application and use it. Most people would jailbreak their iphones or ipads to download and access Kodi. However, you can be able to download and install Kodi without jailbreaking your device. This can be done using Cydia Impactor. Cydia Impactor is a popular app that is used by iOS users to install non-App Store apps on their iPhones and iPads. It is available for MacOS and Windows. For the process, you will need Cydia Impactor and the most recent Kodi.IPA file. The IPA file type of Kodi is not hosted on the official Kodi site, and so you will have to download it from a third party site. In case the link above isn’t working at the time you are trying this out, you can always Google ‘Kodi IPA file download’. Connect your iDevice to your computer or Mac. iTunes automatically opens when you do this, but make sure you close it before you continue. Cydia Impactor will now ask for your Apple ID for verification purposes. This is required to sign the IPA file. As soon as the app is successfully installed, go to Setting> General> Profiles & Device Management. (This procedure may vary slightly depending on your iOS version). Find the profile with your Apple ID and open it. On your Apple device, go to https://www.tweakboxapp.com/. Here, you can download the tweakbox Click ‘Allow’ when prompted. You can now open the Tweakbox app on your device home screen. You can now install your favorite Kodi add-ons and enjoy the most versatile tool for cord cutters and video streamers on your iPhone or iPad. At certain times, subtitles come in handy when watching a movie. Maybe the sound quality of the movie is not the greatest; maybe you only want to use low volume to avoid disturbing others, or perhaps it’s just a new language you are trying to learn, etc. For whatever reason, subtitles help us have a better movie experience and make it much more enjoyable. Good news is that it’s possible to install subtitles free on Kodi. The best way to do this is using OpenSubtitles.org, which is by far the best and most used subtitle add-on. With this add-on, you can even see how other Kodi users have rated the subtitle before you download it. This helps you easily determine the best subtitle for you, therefore avoiding disappointments. Note: To use OpenSubtitles.org, you need to have an account. You can click here to register your free account. Click the Open Package icon on the top left side of the screen. Click the ‘Subtitles’ category. If you can’t see it, go to ‘All Repositories’. You’ll find it there. Select org and then click ‘Install’ on the next screen that comes up. While still on the installation screen, click ‘Configure.’ Here, enter your Username & Password for the account you created. Now, return to the Kodi Home Screen. Go to Language, and select the language that you would like your subtitles to download in. You can now play the movie. To get subtitles, click on the ‘Subtitles’ button present on the player bottom bar and choose the subtitle fileyou want on your screen. Your movie should now play with subtitles! What is a repo (repository) and how to install one? Kodi Repositories, simply referred to as Repos, are like Add-on containers. They are basically Kodi application holders. One can equate Kodi Repos to something the like Google Play Store or App Store. These stores hold various applications uploaded by developers, which can then be downloaded. The same applies to Kodi Repos. They are just a container where Kodi add-ons are contained. When a developer creates an add-on, he places it inside a repository. This way, it’s easy to download, and can be updated easily. When the update is released, it’s available for download/ installation from the repository. You can configure Kodi to check for and install updates automatically. Kodi repositories usually come in the form of a ZIP file. The file however just contains ‘pointers’ to the actual repository, which is based on the internet and not within Kodi. Give a name to the new repository. The repository should now install. You should see it added to the list of repositories. After you have installed the Repo, you can now install add-ons contained within it. Kodi add-ons are the power behind Kodi. If you are not familiar with them, they are the actual programs that let you access media from the internet. You should however be a little careful with Kodi add-ons. Some of them are completely legal, while others are illegal. Most of the legal Kodi add-ons can be found on the Kodi store. This however doesn’t mean that all the other add-ons not on the store are illegal. Some are completely legal, and just have not had a chance to be added to the store. However, others are illegal. What makes them illegal is the fact that they allow users to copyrighted content, which is illegal in itself. This therefore calls for caution when installing Kodi add-ons. Neither BestDroidPlayer nor Kodi supports illegal use of Kodi but if you have to, we advise that you use a VPN to stay safe. Getting an official add-on is quite straightforward. To simplify usage, the official Kodi add-on repo comes preinstalled with the Kodi app. You can add music and video add-ons from here, knowing that the content is legal and safe to use. On the Kodi Home screen, click ‘Add-ons’. After you have installed the Repo, go back to the Kodi Main Menu. Go back to “Add-ons” and click the open box icon again. Select the Kodil repo you just added. It should be at the top of the list under .www.Kodisrael.co.il Repository. Click “Video add-ons” near the bottom, then choose the add-ons you’d like to install. Each installed extension will appear on your Kodi main menu once complete. Kodi is all about it’a addons. If you want to take advantage of Kodi you will need to install some repositories and then some addons contained on that repositories. If you mostly use Kodi to watch Live Sports and matches, we also have a compilation of the best Kodi Addons for Sports. However, keep in mind to always make sure that your VPN is turned on before you start streaming using Kodi. For more information about using a VPN, continue scrolling. YouTube: Youtube is undoubtedly the biggest video-sharing website in the world. It is free, and anyone can upload media. This is definitely one of the best official Kodi add-ons. Twitch: If you’ve used twitch, then you must have loved it. Not for a big reason, but watching interesting people streaming their gaming content is just as fun as taking part in those games. The Kodi Twitch add-on is the way to watch them. The Master List: You don’t have to know all the great and legal Kodi Add-ons. Instead, you can just have master list. It will help you find names you know like Hulu and Netflix as well as networks and programming you have never heard of. Not every add-on can make it to the official Kodi Repo, but these are completely fine. You can easily find them on SuperRepo. USTV Now: This is an online version of the cable channels that most US users have. These include NBC, CNN, Cartoon Network and many more. With USTV, you’ll always find something to watch. To use the add-on, it will require an account. FilmOn TV: This is another Kodi add-on that simplifies cord cutting. With FilmOn Tv, you get access to over 600 live TV channels. You can also set up a recording to watch at your leisure. You will need to set up an account at FilmOn.com. Dbmc (Dropbox): Dbmc may not be a full Dropbox client, but it is a great way of viewing and listening to the media content you have stored in your Dropbox. You can also view your stored pictures in a slideshow. Plex for Kodi: Plex is already viewed as a competitor for Kodi. It lets you greatly organize and watch your content whenever you please. If you want to combine the convenience of the Plex Media Server, but you are already comfortable with Kodi’s interface as your ultimate home theatre media center, you can install the Plex add-on and combine these two services. Here’s the best Plex Channels and how to install them. A Kodi build is a preconfigured Kodi file usually installed through a repository. A build presents newer users with a highly customized version of Kodi. It usually installs various add-ons on your Kodi program and preconfigures a lot of shortcuts to specific areas of add-ons. They have very unique themes, layouts and artworks. One of the best Kodi builds is BEAST. Its home screen is organized into movies, TV shows, encore sports, live IPTV, beast add-ons, kids place, music, videos, programs and system. To use Beast, you will require an account. To create one, navigate to the Beast Website. Creating an account is free. There is an icon on the left corner of the Kodi application which is Settings. It looks like a gear. Open it. On the top corner on the left there is an icon which is the Packager installer. Open it. Once that is done just wait for a notification box to appear then go to my add-ons and choose Beast Wizard. Once you have selected the one that you want then the download will start. We know that one of the best things Kodi can bring to our screens is Live TV. IPTV provides us with a good way of watching Live TV, and you can easily incorporate IPTV to Kodi using IPTV Simple Client. With the method I will show you, you can get about 2000 TV channels from all over the world. Remember that to stream Live TV safely, you will need to encrypt your connection using a reliable VPN service like IPVanish. Kodi may tell you that the PVR needs to restart. Accept and Simple Client will be installed. Now we need to enable the client. 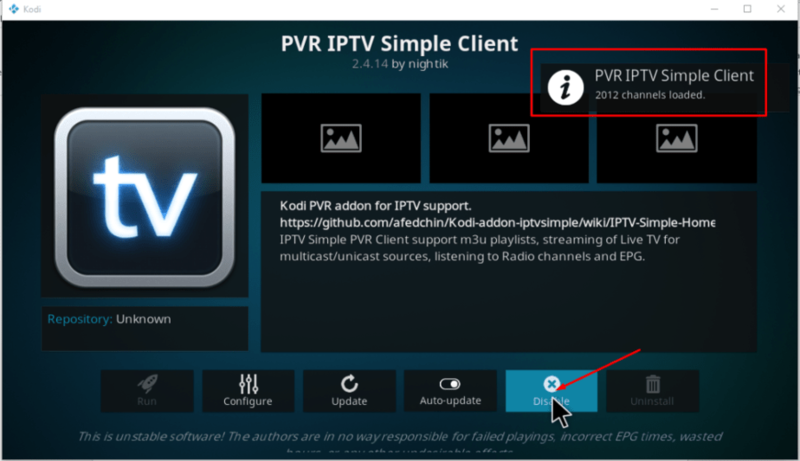 Select PVR IPTV Client and click ‘Enable’. Your channels will be loaded. You can now go back to the Home Screen and Select TV. The 2000+ channels from all over the world will be available. You will also get a shortcut for the recently played channels just under the ‘TV’ category. Keep in mind that some channels won’t play depending on your location, and you will need IPVanish running in order to unblock them. It’s now possible to select the type of media that you want to add to the Kodi application. Select Yes. All the contents will be scanned in the library and added to Kodi. New is always interesting, and Kodi Skins are always a great way to enhance your favorite media player’s look. 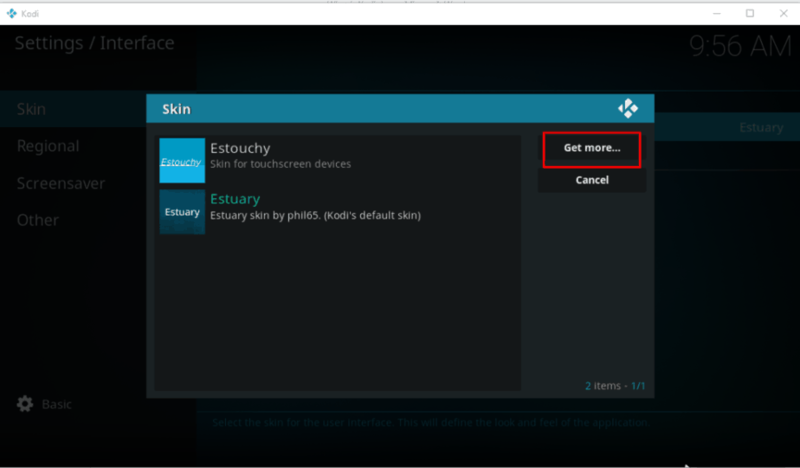 It easy to get a new skin for your Kodi program, and here is the procedure. Navigate to the top of the menu and select the gear icon, which will lead you to System Settings. In the Interface settings, select Skin, then Skin under Look and feel. In the new window, select the skin you want to install from the list. Despite Kodi being an open-source streaming software, there is content Kodi can’t access, depending on where you are. There are so many regional restrictions that apply on Kodi. You may be able to install an add-on, but that add-on can fail to work. This is because the content that should be provided by that add-on has geographical restrictions. Let’s say you add the BBC iPlayer Kodi add-on to your computer. This add-on will not work unless you are in the UK. What happens is that BBC checks your IP address and then determines where you are accessing their services from. An IP address carries a lot of information, and among these is your ISP provider and country. If you are not in the UK, you are denied access. Thankfully, all this can be overcome and you can unblock all restricted content on Kodi. The best way to do this is by the use of a VPN like IPVanish. VPN stands for Virtual Private Network. It is an online based subscription service that lets you create a virtual private network using your ISP’s internet access. To do this, a VPN encrypts your traffic using a security protocol and then tunnels it to a VPN server of your choice. To access the internet, you will now use your new server, rather than the one set up by your ISP. During this process, your ISP is changed and you get a new IP address, which effectively gives you a new online identity. This way you are able to stay private and anonymous. If BBC iPlayer blocks you because of your location, you now only need to connect your VPN to a UK server. If you are using a good VPN like IPVanish, you will unblock BBC iPlayer. Now, on this Most Complete Kodi Setup Guide we think is important to highlight those benefits, as is never enough protect you from troubles with the law. To unblock geo-restricted streaming services. Services Hulu Plus, Channel 7, BBC iPlayer, ESPN, Fox and many other global TV channels are only accessible in certain regions. Evade geo-restrictions placed on some shows. While you may be able to access a streaming service like Netflix, some shows are never in your library if you don’t stay in a certain region. Netflix’s House of Cards, HBO’s Game of Thrones, Arrow, NBC Parks & Recreation, Person of Interest etc. are some shows restricted to US audience. Enable installation of blocked add-ons. Gain access to P2P & Torrents without getting tracked & receiving copyright notices. Stop ISPs from conducting DPI (deep packet inspection) and track your browsing activities. Step 1: get the IPVanish Android App from the Play Store. If on your PC, just download IPVanish here or from the official site. Step 3: Login to the VPN app and connect a server depending on the content you want to access. Step 4: You now have a new IP address. Run Kodi and then try running any blocked add-on. It should work! Choose a VPN server from this list https://account.ipvanish.com/index.php?t=IP%20List and enter it in the address field. Tap the VPN to test connection and log in with your IPVanish credentials. On the top right corner, there should be an option that lets you keep your VPN ‘Always Enable’d. Make sure you tick it so you won’t have to do this again when you want to use Kodi. Every time you turn on your Android TV Box, your VPN will automatically run. Though this method is more convenient since the VPN will automatically turn on, it doesn’t allow you to change your server as easily as using the other method. With the cloud surrounding the misty world of Kodi add-ons, you will always find various difficulties with Kodi. This is due to the war being waged against illegal access of copyrighted content. ISPs, therefore, block specific add-ons from working, or from displaying certain content. In other cases, the errors you get while using Kodi may just be due to the geographical restrictions imposed on specific channels or videos. Most of the errors you get while using Kodi can easily be fixed by the use of a trusted VPN. With IPVanish being the best VPN for Kodi, you can just grab it and make the most out of Kodi without restrictions! You can also have a look on our article about how to fix kodi errors. Hope this Most Complete Kodi Setup Guide, have helped you on install an using Kodi, like a Pro. If so, please share this guide with your friends and help them too! Thanks for the complete guide for Kodi.TV all the important points are covered and will help manh who are installing Kodi first time. I have a query. Have installed Kodi on my SonyTV using Android TV box. Able to install many repo and able to watch many programs. How to download TV series and store on my external hard disk? I suggest you to use the ShowBox App, they have the option to stream or download to watch later.